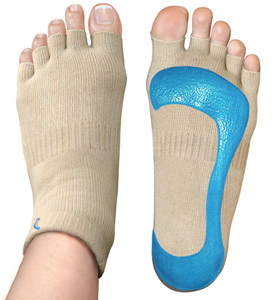 I wonder if the manager of the gym will allow me to wear these in the gym in locations other than the yoga classes. They sell them, so they must be acceptable. Not sure I'll spend over £15 for a pair of socks though, especially when these funky coloured yoga toe socks are half the price (I got my wife a pair and she loves them) and way more fun. Given how popular yoga and pilates are and how "in tune" they are with being barefoot, I'm surprised gyms are still so iffy about being barefoot.